There are a number of tools used by stamp collectors and philatelists. Aside from the stamps themselves, I would argue that the most essential item needed by a collector would be a good pair of stamp tongs — the “tweezers” used to handle postage stamps. The jaws of stamp tongs are smooth in contrast to the striated jaws of the type of tweezers one might use to grasp and pull a thorn; such tweezers will damage stamps. 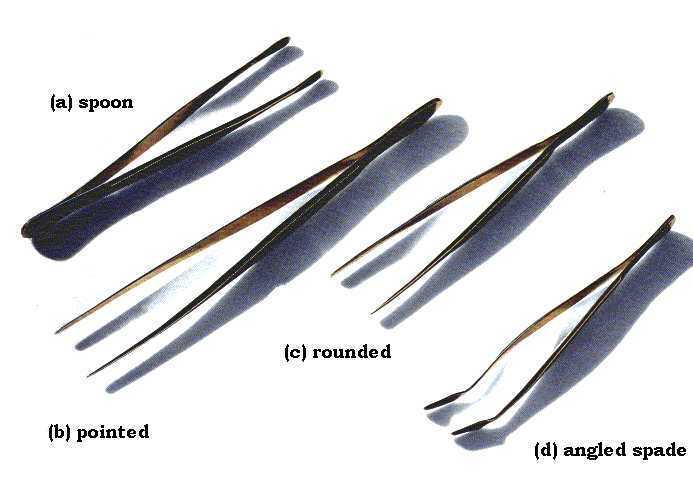 I should mention that “tongs” is the American terminology while British collectors do call the same tool “tweezers”. 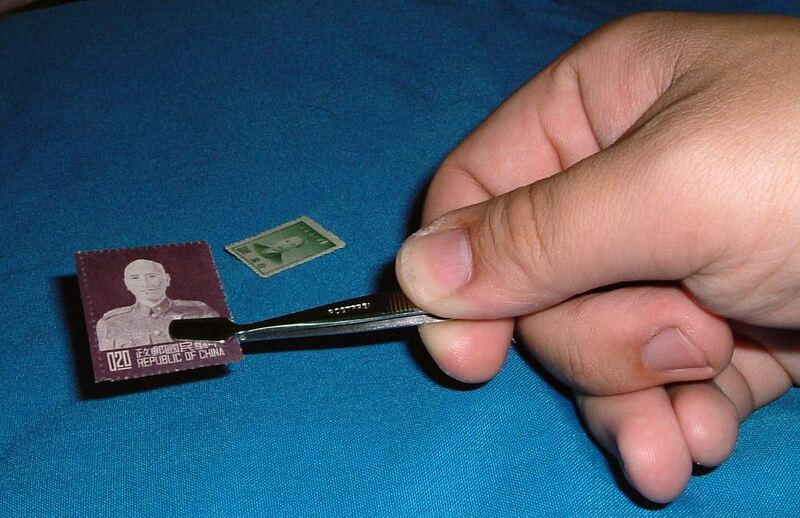 The condition of stamps is important and it is vital to use caution when handling them. We use tongs to avoid touching stamps with our fingers as the natural oils on our skin can leave traces of oil on a stamp that will cause discoloration over time. Just take a look at the screen of a smartphone, tablet computer or other touch-screen device after use and you will see an accumulation of oil from fingertips. Stamp tongs. Photo taken on February 5, 2014. In addition to oil transfer, using your fingers to pick up stamps from a tabletop or out of a stock book can easily cause damage by bending or creasing the stamp paper. In addition to preventing damage, tongs can also be an efficient way to handle a small stack of stamps for soaking or sorting. They give you a better grip on the stamp so it isn’t dropped onto the floor. While a beginning collector might need a bit of practice to master the use of stamp tongs, eventually they feel almost like an extension of one’s own arm, becoming second nature. Quality tongs are inexpensive and last a long time. I own one pair, spoon-tipped tongs by album manufacturers Davo of Great Britain, purchased more than twenty years ago. In fact, they are the only item remaining from my “second phase” of collecting which I left behind upon moving to Southeast Asia. At the time, I didn’t realize that I would soon begin delve into stamps once again. Stamp tongs are nearly always made of metal, with lengths ranging from 4 to 8 inches (10–20 cm). The tip is usually thin, so it can slide under a stamp easily, and may come in several different forms. The “shovel” or “spade” tip is a broad spatula shape, often bent at an angle. The “pointed” tip tapers to a sharp point; while useful for precise positioning, as when mounting the stamp on a page or picking a particular stamp from a pile, the sharper tip can also tear a delicate stamp. 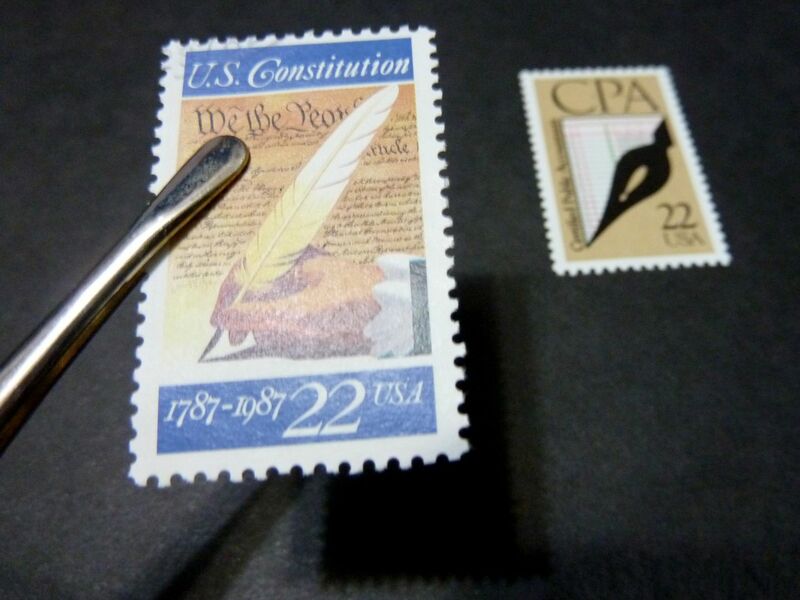 There are also “rounded” (also called “spoon” or “paddle”) tips available that beginning stamp collectors like to use to avoid damaging their collection. Using stamp tongs. Photo taken on May 20, 2007. “Hold the tongs in whatever hand you use predominantly (the right hand for a right-handed collector, for example). Hold them in much the same way that you would hold a pencil, with one side resting against your index finger or middle finger, and with your thumb resting on the outer leg of the tongs. Some tongs have ridges along the sides that provide a good grasping point. Linn‘s goes on to recommend treating tongs “with respect. They are precision tools and handling them with care will keep them working properly for many years to come.” One should periodically clean the tongs and the tips using a soft cloth to remove any foreign material that may have accumulated. There is no shortage of stamps that portray the usage of stamp tongs when handling a collection. There is one glaring exception, however. On May 15 1947, the Principality of Monaco released a set of five air post stamps marking its participation in the Centenary International Philatelic Exhibition (CIPEX) held that month in New York City (Scott #C16-C20). The lowest denomination was a 50-centime violet stamp depicting former U.S. President Franklin Delano Roosevelt examining a stamp from his collection (Scott #C16). This seems to be one of the most popular stamp collecting-themed stamps among collectors, and one of the few portraying FDR pursuing the pastime. This stamp actually contains a design error. While President Roosevelt is depicted using a magnifying glass to look at his stamp, he is holding it by his fingers rather than using tongs. Oddly enough, this isn’t the “error” mentioned by collectors. Instead, they point out that the recently deceased philatelist-in-chief has six fingers on his left hand! 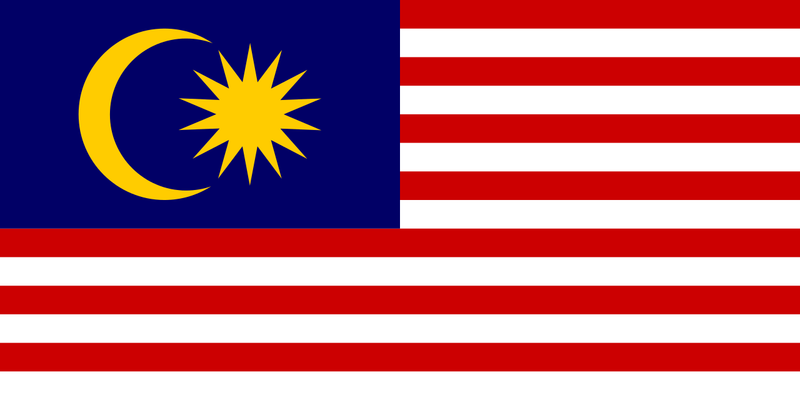 Malaysia – Michel #164a (2012). 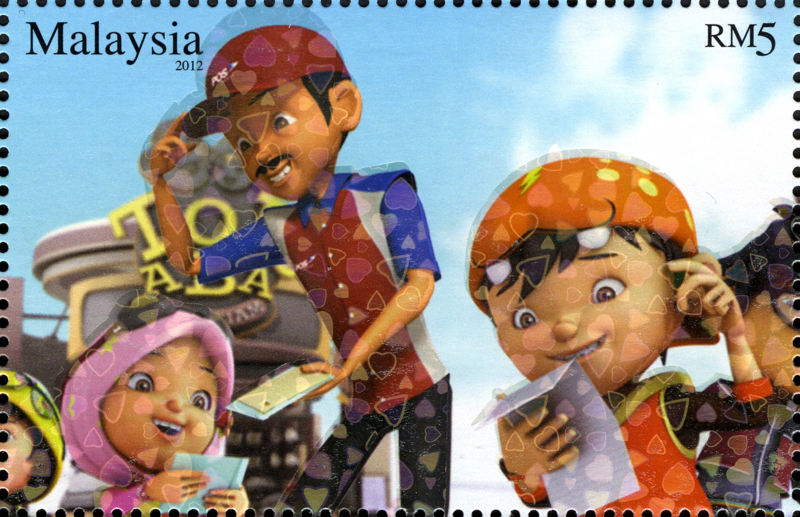 The large stamp from the souvenir sheet has a three-dimensional element. The six stamps were offset-printed by Joh Enschedé Stamps BV of The Netherlands. Each carries a denomination of 60 set and were printed in sheets of 10, perforated 14. The souvenir sheet was printed in lithography by Percataken Keselamatan National in Malaysia and is valued at 5 ringgit. 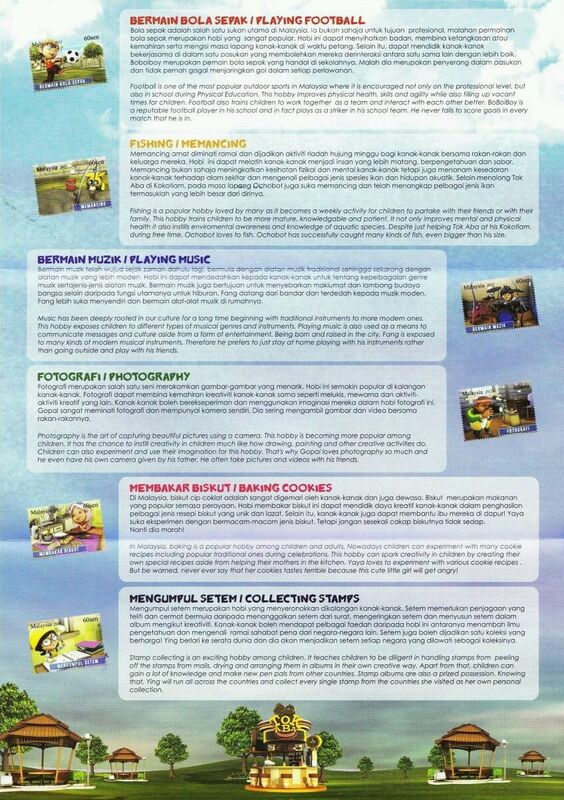 The set was designed by Animonsta Studios Sdn Bhd. On Michel #2018, a young girl named Ying is holding a stamp from her collection, properly using stamp tongs to avoid damage. 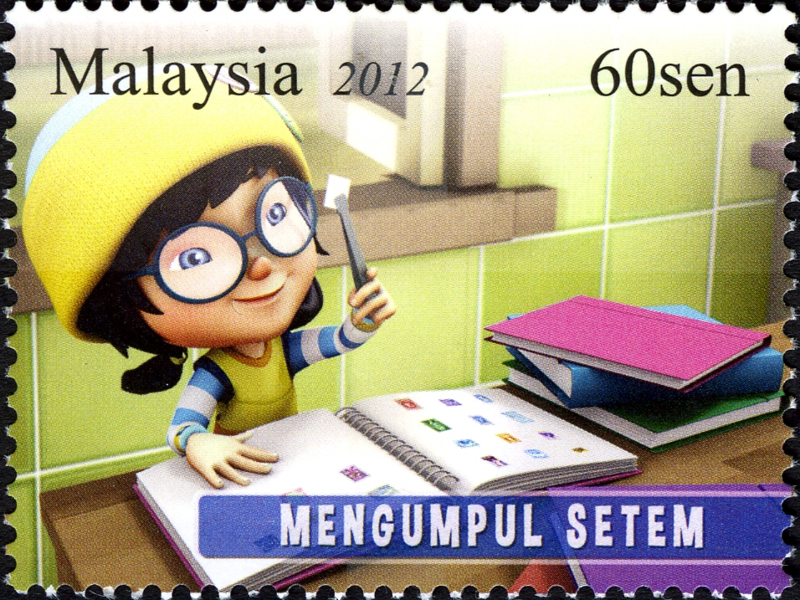 POS Malaysia tends to issue quite a few postal- and philately-themed stamps during each given year. Just in 2012, there were releases marking the Diamond Jubilee of Queen Elizabeth II by reproducing the 1953 Coronation issue of Malaya Selangor (Michel #1988 and #1990), a five-stamp issue for World Post Day featuring postal uniforms (Michel #2000-2004), four stamps marking 100 years of Kedah postal history (Michel #2020-2023), and a souvenir sheet for the World Stamp Championship and Exhibition in Indonesia (Michel #BL150I). The Diamond Jubilee, World Post Day and Kedah Postal History issues also included souvenir sheets (Michel #BL161, #BL163 and #BL165, respectively).